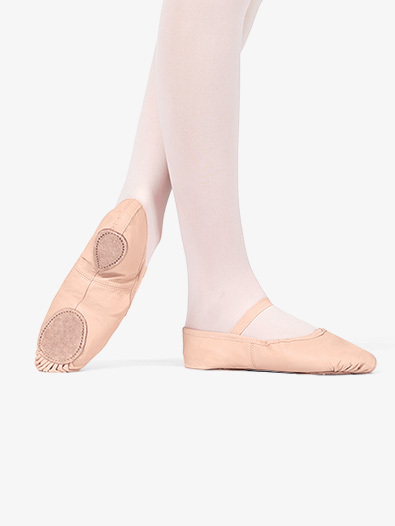 This split-sole ballet shoe is made from a lightweight, soft, leather upper and features an elastic drawstring, a cotton lining, a suede sock lining, and an attached elastic. Ultra flexible, comfortable, and durable. Suggested Fitting: 2.5 sizes smaller than street. I have always used name brand shoes, but the studio I am teaching in has a very dirty floor so I decided to try something more economical than the brand name shoes. I found these to be Narrow to the extreme. The materials, craftsmanship and construction appear to be adequate. I work my shoes hard, and they appear to be holding up to relatively the same level as brand name shoes. I did not expect this high of quality for the economical cost. GREAT if you have very narrow feet, takes time to stretch out if your feet are wide. We decided to keep these shoes becasue by the time I paid for restocking and return shipping..well a return wasn't worth the effort. The shoes fit oddly. The toe on one of the shoes was longer and protruded on the outside of the foot. My child said she'd keep them to bumm around in but would not wear them to dance class for fear of tripping. I was not satisfied with the shoe at all. They were good quality, however were sewn or cut incorrectly. We went with the single elastic strap, although we had previously wore slippers with double elastic straps, and the single strap left major gaps on either side of my daughters arch. This made the shoe slip while she flexed or pointed. It was recommended to go three sizes below street size, which length wise was good. Good quality materials, but overall the slipper didn't work for us. Hi, Really unhappy with this purchase. I followed your recommendation about sizing and my daughter can't even slide her foot in it. It's at least 2 sizes too small. I wish you let me send them back for free as I have no use of them but the restocking and shipping fee are not worth sending them back. I bought these flats for the dance classes I am taking in college. I had a pair already but not only were they a half size too small and very worn, they also managed to get lost in the shuffle at home (or so my mom says haha) Since I'm in college and on a tight budget my first instinct was to go to payless shoes. bad choice. they were cheaply made and more expensive than the one I found on here. Knowing full well my money was better spent here I placed my order. I got a 5.5, my street shoe size is 7.5 and they fit great! They look good, feel good, and I got a much better shoe for a better price than I would have gotten else where! I can't say much on the durability just yet since I've only done a few classes in them so far, but thus far they have held up great. I would definitely recommend them! I've had these shoes since June. The sizing was perfect, and they are very comfortable. However, I noticed that when I did pirouettes, they would stick to the ground and would make squeaky noises at first. This went away as I used them more and there was more dirt/residue on the bottom of them. They were also kind of stiff at first, but as I used them, they became softer. Also, the color of the leather peels off on areas where there is a lot of friction. The parts on the ball of the foot have spots where the pink was rubbed away, leaving behind this white/yellowish background. Other than that, these shoes are great! I hated them at first, but now I've grown to like them. This was my first time ordering dance shoes without trying them on. I followed the sizing guide EXACTLY as it stated and the ballet shoes fit perfectly. I wear 8.5 street shoe, followed size chart to go down 2.5 sizes to a 6. Fits perfect. They're soft and comfortable. Love! I can't comment on the quality because I had to return these. They were way too big, despite following the sizing chart. My mom thought I should get a 6 so I did.... its too big, I wear a 71/2-8 street shoe and the 6M was about 1/2 an inch too big, if I grow into them they will be a great shoe. I have really bad balance and these are great for that and they are also very flattering. If you need new dance shoes and are hesitant to get these, they are great shoes and so far I see nothing wrong with them. What brand is the quality of this shoe comparable to? This shoe can be compared to bloch or capezio products. Its a very good quality for a great price. I'm size 37.5, but 38 fits me better in street shoes and boots, what's my size for this one?